And today’s lesson actually comes from a tomato plant. Back in late April, my mom and I each purchased a tomato plant. Both plants already had small tomatoes on them, but the tomatoes were still green and in the growing stage. I was excited about the prospect of having shiny red tomatoes at some point in the future. I took great care of my plant. I watered it regularly, I fertilized it, I pruned it, I spoke positively to it. I was so happy to have it, and couldn’t wait to see the end result. One day, while at my mom’s house, I saw that the tomatoes on her plant were already red and ripe for picking! Suddenly, once home, I was looking at my own tomato plant through a new lens: What was wrong with it? Why weren’t its tomatoes red like my mom’s were? Why was it behind schedule? What went wrong? On and on and on. And then at some point, something occurred to me: had I never seen the progress my mom’s tomato plant had made, I would’ve never begun to believe that something was wrong with my own plant. Sometimes in life, it’s not until we see how far along others are in their journey that we begin to question our own. We see others enjoying the success we want to enjoy, having the life we want to have, making the money we want to make, traveling to the places we want to visit…and suddenly, it puts us in a funk. We start to ask those hard questions: What’s wrong with me? Why aren’t I as far along as they are? Am I off track? Am I behind schedule? Did I do something wrong along the way? The fact of the matter is that we can’t compare our journey to someone else’s journey. Not only will it endlessly frustrate us, but it just doesn’t make sense, because guess what:what’s meant to be yours cannot go to anyone else. If it’s written in the stars that you’re meant to accomplish what you’re aiming for or that you’re meant to have what you’re dreaming of, then eventually, that’s going to happen. We need to stop acting like success or happiness is in short supply. No, there’s enough for everyone to have! But comparing your journey to someone else’s isn’t going to expedite you getting what you want. Neither is beating yourself up over it. That’s just going to make you feel miserable, which will actually keep you stagnant and stuck right where you are. I decided to stop comparing my tomato plant to my mom’s. 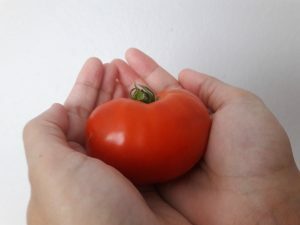 I decided to trust that its tomatoes would turn red when the conditions were right and when the timing was appropriate for my own plant’s needs. I continued to care for it, sending even more love its way. And you know what happened? A few weeks later, its tomatoes indeed started to turn red, and yesterday, I was able to pick my first shiny, red tomato from the vine! What was meant to happen eventually happened…not on another plant’s timeline, but on my own plant’s unique schedule for its own growth. In life, there will always be people who are ‘ahead’ of you or who seem to be ‘further along’ on their journey. Just as there will always be people who seem ‘behind’ you or not as far along. And that’s okay. Because we’re each walking our own unique path in life. We’re each learning our own lessons on a timeline that’s just right for our own needs and growth. So trust in your timing. Trust in your journey. And trust that everything you need and desire will come into your life right when it should.